When my husband and I lived in New York City years ago, we regularly hit various Italian restaurants around the city, from the authentic joints in Little Italy to the family-style place near our apartment. While we had our fair share of risotto and shrimp Parmesan (one of my favorites), what sticks in my mind is the tomato sauce. Simple, fresh and beyond flavorful! Even though I’m sure the sauces were being whipped up by some twenty-something chef phenoms, I liked to imagine that an Italian nonna was back in the kitchen, putting together our meals with a pinch of love. These turkey meatball recipe in homemade tomato sauce remind me of those New York experiences, though I can’t claim to have the touch of an Italian nonna. That being said, this is one of those meals that will appeal to everyone in the family, and is rather forgiving. Lopsided meatballs…no big deal! Too much sauce…fuh-get about it! Typically when I make meatballs, such as my Baked Teriyaki Turkey Meatballs or Baked Turkey, Quinoa & Zucchini Meatballs, I make morsels that can be consumed in one or two bites. But these…these are serious meatballs. 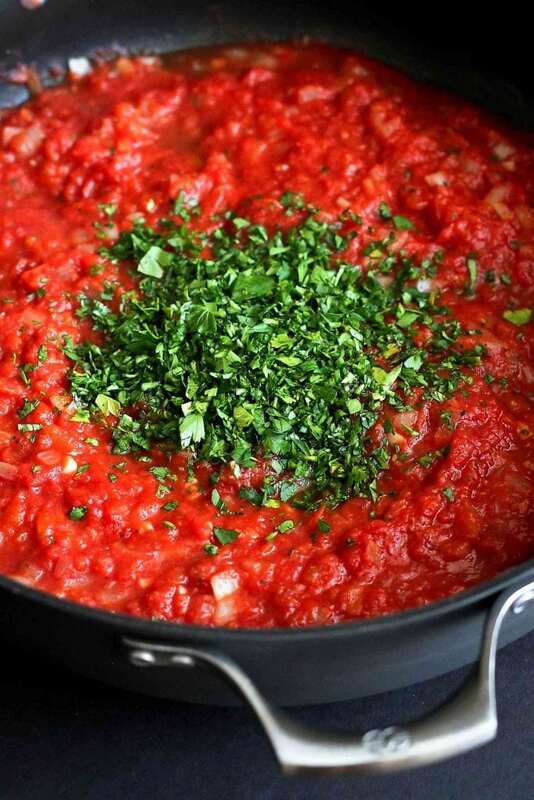 They bake in about 20 minutes, which gives you just enough time to whip up the tomato sauce. These meatballs can be served over pasta, rice or cauliflower rice, or eaten solo – whatever appeals to you. Preheat the oven to 350 degrees F. Lightly coat a baking sheet with cooking spray. 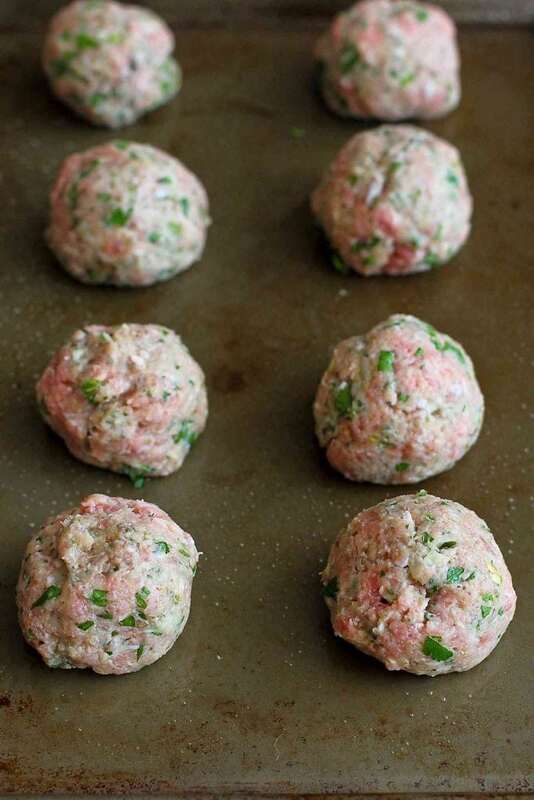 In a large bowl, stir together the ground turkey, onion, garlic, parsley, breadcrumbs, egg, oregano, salt and pepper. Divide the mixture into 8 portions, form into balls and place on the prepared baking sheet. 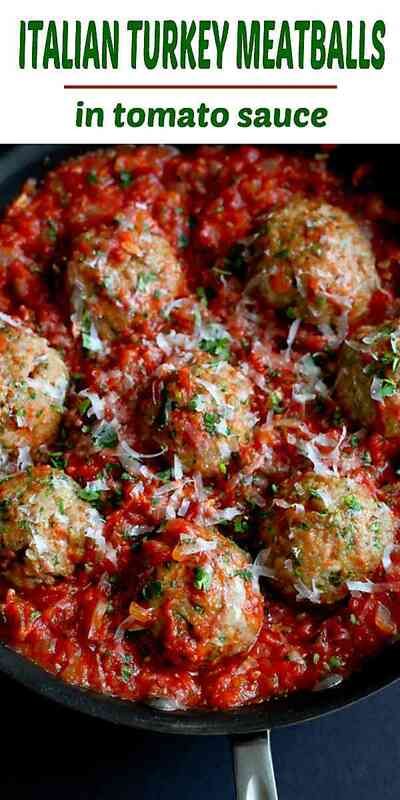 Bake until the meatballs are firm to the touch and cooked through, 15 to 20 minutes. Heat the olive oil in a large nonstick skillet set over medium heat. Add the onion and cook until softened, about 5 minutes. Nestle the meatballs into the sauce and spoon sauce over to coat the meatballs. Serve over pasta or rice, or on their own. This recipe was originally posted on March 2, 2015, and has been updated. these meatballs look delicious and I love how healthy they are. I’m with you – I could dive on in to the dish of these yummy meatballs and sauce! Delicious! We’ve been eating a lot of turkey lately. Love these flavorful meatballs Dara. Beautiful photos 🙂 I think I know what I’m making for dinner tonight! This sounds so so good! I’ve been trying to swap turkey in place of beef in a lot of recipes lately. Can’t wait to try out your meatball recipe. Now that is a meatball dinner! I love the size and the homemade sauce!! Perfect dinner choice!!! 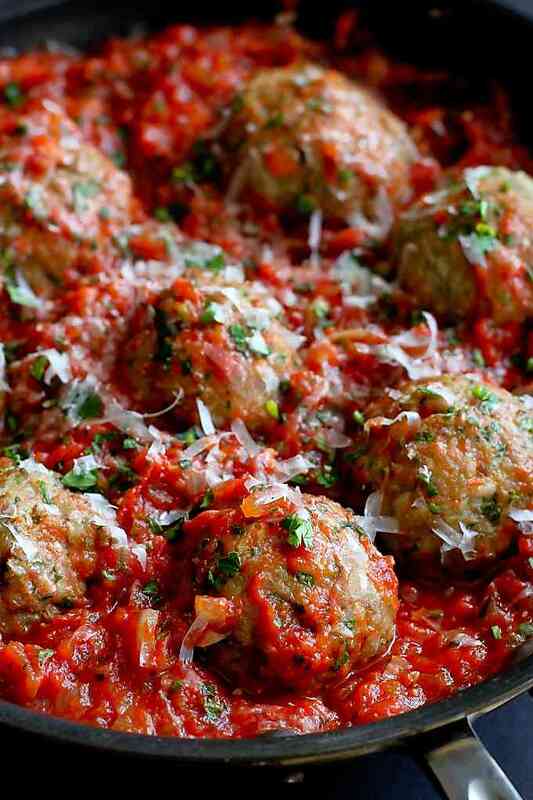 I love your spin on the typical Italian meatball made healthier but still looks so comforting! These look like the perfect meatballs! Saving and sharing! I don’t know anyone who can turn down meatballs – love this healthy version! Sometimes you just need a big-ah meat-ah ball! (that was my attempt at writing with an Italian acccent…) I love the sound of the meatballs and the simple, vibrant sauce! 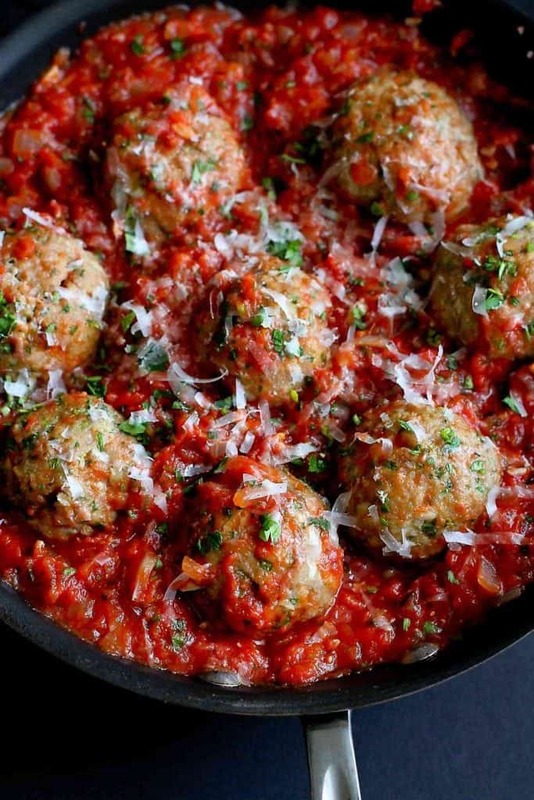 I’ve been dying to have meatballs, these look absolutely perfect! I totally want to swim in a bowl of these meatballs! They are perfect! I have been so into meatballs lately as well! I just make a huge batch at the beginning of the week and it lasts for days! Pinning this for later! Meatballs are the one thing no one in my family can resist. Your version looks fantastic! I saw your recipe just before my weekly trip to the store yesterday and I am so glad that I did. I made this dish last night for dinner and it was fantastic! Both the meatballs and the sauce were very flavorful. I will be making this again. Thanks! Oh those look delicious – I may have a personal weakness for meatballs in tomato sauce. Yum! There is nothing as satisfying as a really good meatball in red sauce. Looking at these photos and I think yours would do the trick. I’m finding that I enjoy a turkey meatball even more than a ground beef meatball these days. As long as they’re not dry. These look great, Dara. Very pretty pictures too! I’m not sure I knew you lived in New York for awhile. Such a fun city. I love these meatballs so much. There is nothing more comforting than a big helping of meatballs. And you’ve made them healthier so I can eat more and not feel guilty. Made these turkey meatballs and tomato sauce with spaghetti pasta for dinner last night. It was a huge hit with the family. Love love love the turkey meatball version, so juicy and flavorful! And best of all, it came together so quickly! Won’t be buying frozen meatballs ever again!!! Thanks for the shout-out! The meatballs look delicious! Recipe is great, tastes good but meatballs took well over 20 minutes to cook through at that temperature more like 30-35 minutes. Is there supposed to be 2 separate quantities of crushed tomatoes? The recipe is confusing to me. Hi Tara, I apologize for the confusion. So, there should be a total of 42 ounces of canned crushed tomatoes, which equals one 28 oz. can plus one 14 oz. can. I hope that makes sense! I have made these several times now. I also forwarded the recipe along to my daughter and two nieces and it has gotten rave reviews. It really is a wonderful way to make meatballs healthy without giving up flavor.. I also use the sauce when I need a quick sauce even when I don’t make the meatballs. Thanks! I’m so glad to hear that, Kathy! Thank you for letting me know. I’ve made these before and they are absolutely delicious! So tender and flavorful! I have a question about making them ahead of time. If I were to freeze the uncooked meatballs, how long would you suggest to cook them if they went straight into the oven from out of the freezer. Thanks! Hi Natalie, I’m so glad you enjoy the meatballs! The general rule of thumb that I use is to cook frozen meatballs about 50% longer than unfrozen ones. That being said, be check them along the way to make sure that they’re not becoming overcooked.